I was thinking about Halloween and what kind of post to do this year, which is hard since Halloween wasn't a big deal during WWII and really wasn't even much of a children's holiday. Halloween and trick or treating didn't become a such a big thing for kids until after the war. Searching through my virtual folder marked Halloween, I came across this old ad from a 1943 Life Magazine. 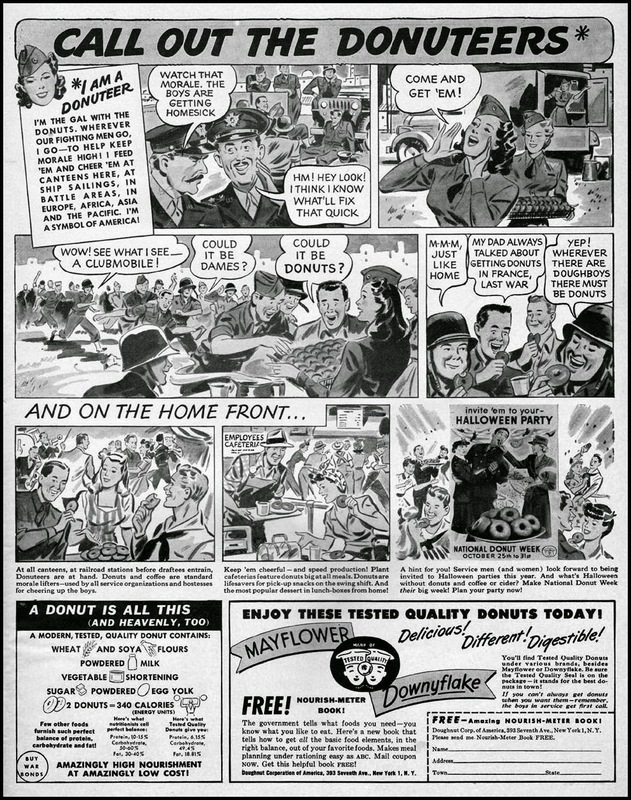 I had already done a Weekend Cooking post called Victory through Donuts about the hard-working canteen women of the Red Cross, who went all over this country and Britain handing out coffee and donuts to soldiers, and thought I was done with donuts of WWII. 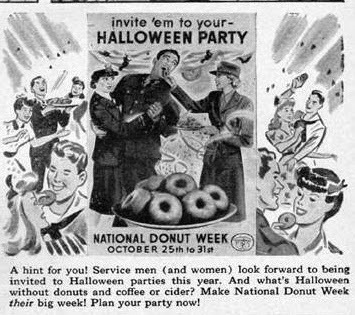 But when I saw that little square at the end of the illustrations, reminding people to invite servicemen to their Halloween Party, and to serve donuts, I began to wonder why donuts are so much a part of Halloween festivities. Enlargement from the above ad. Turns out, there is a reason for it and it has noting to do with servicemen or WWII, but is interesting nevertheless. So, what's the scoop? It all began with an old English custom, mostly likely stemming from the very early Middle Ages, if not actually from the dark ages. All Hallows Eve (October 31st) was traditionally the time that the dead return to earth along with all manner of dark forces, such as witches, ghosts, goblins, and devils, to wreck havoc and mischief. And it was a day when Christians would stay home and lit fires to keep away any of these spirits. On the next two days, All Saints' Day, also called All Hallows Day, and All Souls' Day, it was the custom of the poor and destitute to go out begging, or a-soulin', from door to door and singing their traditional soul song. Legend has it, however, that the beggars were more interested in the food they received and not terribly in the prayers they promised in return. One woman decided to cut a hole in the middle of the soul cake, fried it in deep fat and gave them out to anyone who came a-soulin'. The circle was a reminder of eternity, where we will all end up someday. Whether true or not, it is the precursor to having donuts at Halloween. NB: I've give just a basic description of soulin' and soul cakes. 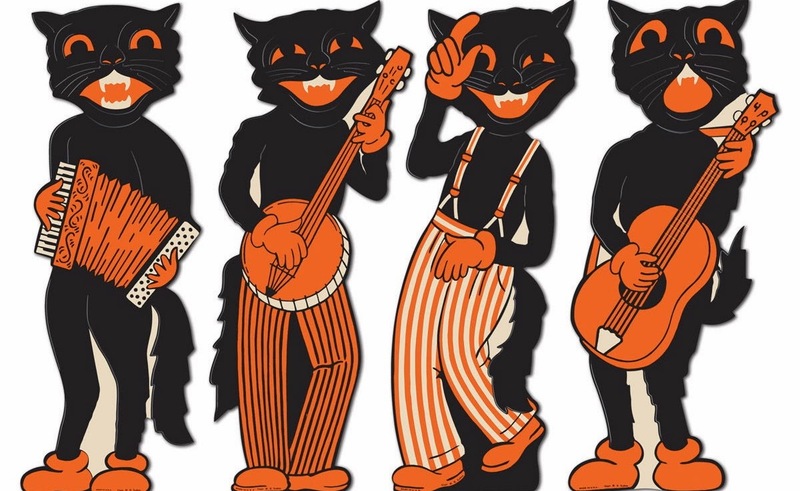 There are actually a number of descriptions about the origins of these traditions, and the roots of Halloween. 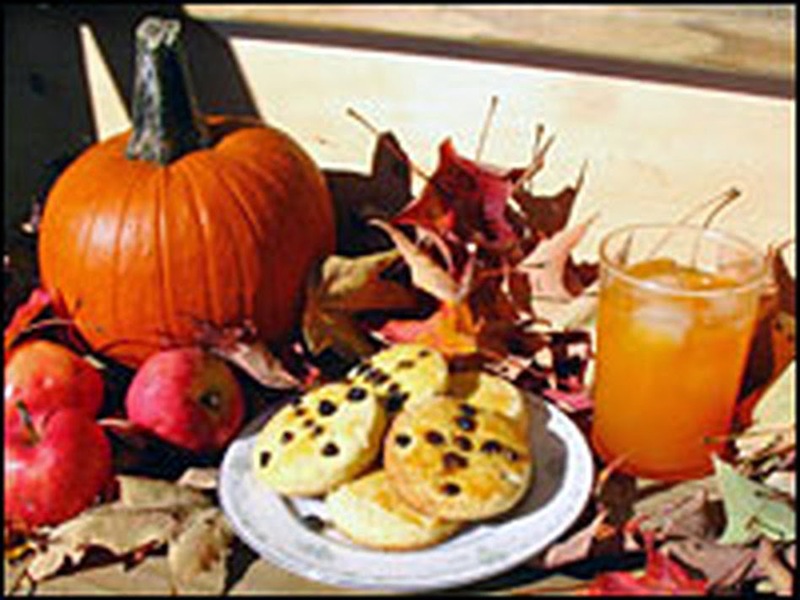 You may even recall that soul cakes were mention in the novel Catherine, called Birdy by Karen Cushman. Thanks, Stephanie. 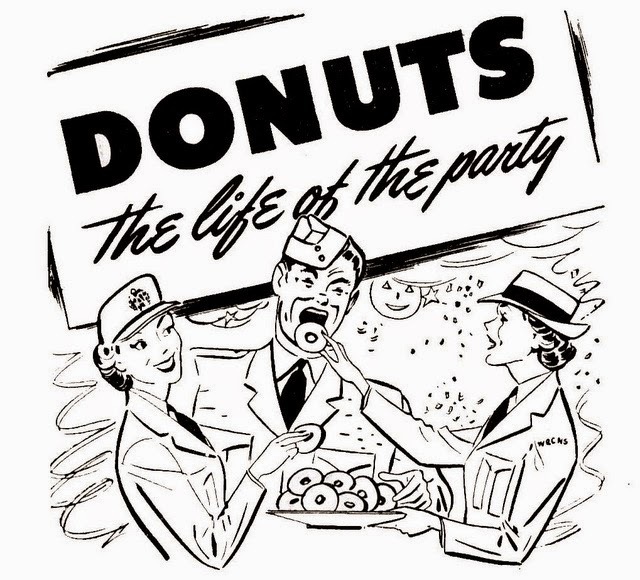 Actually, I didn't have any donuts for Halloween either, now that I think about it.